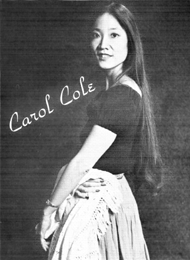 Carol Cole is a third-generation Japanese-American, the daughter of Frank and Amy Mitoma, both Life Masters in bridge. Carol Cole Carol has a Master's Degree in Library Science from the University of Michigan, and is currently working as a full-time librarian. Carol is married to phychologist Larry Cole, and is the mother of two sons. Carol has played backgammon for five years. She placed in the intermediate class of the Indiana Open and the Puerto Rico Championships, and won a few Michigan events. Her biggest triumphs — first place, 1980 Louisville Labor Day weekend (intermediate), and the all-time master-point leader of the Flint Area Club. The Flint Area Backgammon Club was organized in 1978 by Carol Cole and Amy Mitoma. Weekly tournaments average forty-five players. The club has a master-point system, monthly newsletter, and several special tournaments during the year. There are no membership dues or elected officers. It meets in a bar/restaurant (Rusty Nail). The club stresses friendliness and fair play. Asked for some personal comments, Ms. Cole said, "I love this game because I find it to be intellectually and socially stimulating. I've met all kinds of strange and wonderful people in the backgammon world. I've reached a level of skill where my backgammon adventures pay for themselves. My family comes first, but they have to tolerate my addiction to backgammon. I probably average twenty hours a week on backgammon, including one or two tournaments a week. I agree with top female player Lee Genud that women may be better suited emotionally to backgammon than most men. Men's egos get twisted during the game, especially their cube judgment, and they often have a tough time handling losses to females or weaker players. I appreciate a good sport. I believe one can be a winner without having a cutthroat attitude. I am also a strong advocate of double-elimination tournaments."